Step 1. Stand a Wooden Spill in a ball of Plasticine. Step 2. Cut two Doyleys in half. Fold the half Doyleys to make cones and staple each one. Step 3. Wipe Supertac onto the Wooden Spill and slide a cone onto it. Squeeze together the top of the cone. Repeat with the other cones. Step 4. Decorate with Buttons. Step 1. 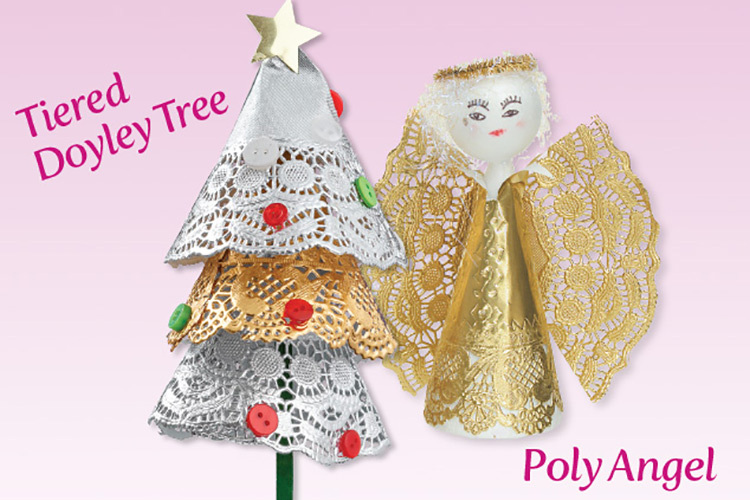 Cut a gold Doyley in half and glue one half around a poly person. Step 2. Cut the other half of the Doyley in half and glue the two pieces on as wings. Step 3. Use Metallic Yarn for hair and a Tinsel Stem for a halo. Step 4. Draw on a face.